Fig. 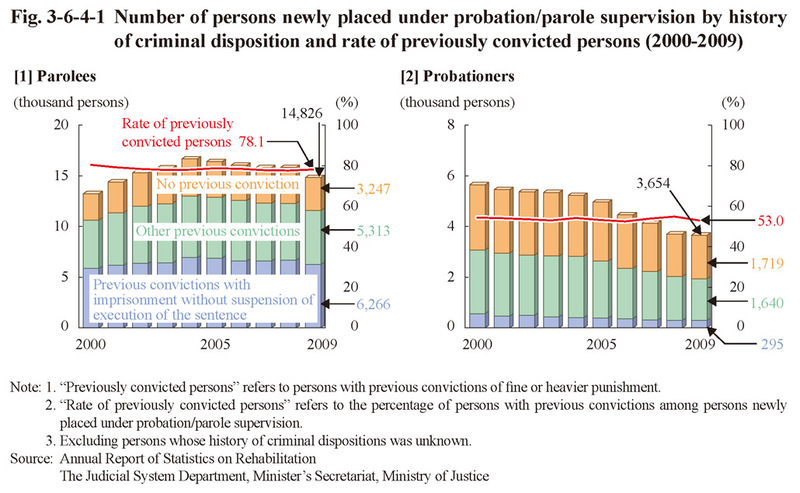 3-6-4-1 shows the number of previously convicted persons (limited to those with previous convictions of fine or heavier punishment; hereinafter the same in this subsection) newly placed under probation/parole supervision and the rate of previously convicted persons (refers to the percentage of persons with previous convictions to persons newly placed under probation/parole supervision; hereinafter the same in this subsection) over the last 10 years. 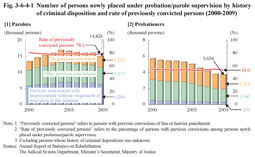 The number of previously convicted persons among parolees was on an increasing trend until 2004 but then turned to a decreasing trend from 2005 on, while that among probationers was consistently on a decreasing trend from 2000. The rate of previously convicted persons has remained stable with both probationers and parolees.